Working with museum-grade synthesizers and sequencers brings the realizations of Jeffrey Koepper all the closer to the electrical current at the source of all electronic music. His cache of late model gear operates at the mechanical level today's virtual modeling synthesizers attempt to recapture. Certainly Koepper's diagnostic familiarity with this equipment informs the music on Momentium. An interesting balance between sensibility, technology and technique, this album presents eight pieces which range from fluttering thought tones, to echoing synth pulses, to cerebral powered beatbox. Influence is an invisible shadow cast on this work, as Koepper is ever reverential to both the artists and engineers who pioneered the genre he now navigates within. His endless fascination with the sequencer, a device meant to provide a steady run of predetermined notes, dominates this disc. The interlacing latticework of patterns becomes an animated force carrying reverb laden harmonic figures into the foreground. 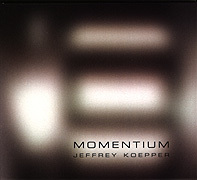 Koepper's subtle real-time adjustments to timbre and counterpoint provides this work with enough variation to keep it out of the realm of minimalism while referencing this genre's pulsing motorlike motion and incrementally expansive growth. In his music, Koepper is seeking a sense of voyaging. Yet, as in all quality spacemusic endeavors, we do not leave the listening area. Momentium is a stationary adventure meant for the contemplative audience.